I had to pop into the Prince Alfred's Guard Museum to other day to take some pics for a brochure. I've actually never been in the museum before then, although I know the monument at St Georges Park quite well. 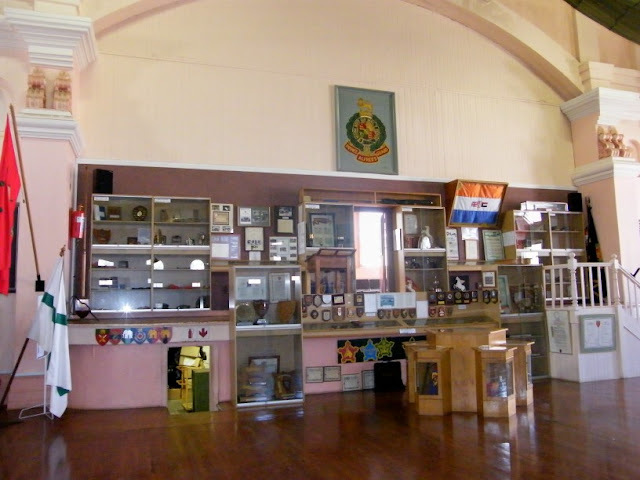 The museum houses military exhibits in the Regiment's Victorian Drill Hall (built in 1880). It is a national monument and one of the finest surviving examples of its type. Prince Alfred's Guard was established on 19 September 1856 as the Port Elizabeth Volunteer Rifle Corps. In 1860 the title Prince Alfred's Guard was assumed unofficially (after Prince Alfred, Duke of Edinburgh) and on 11 July 1874 this name was officially sanctioned as Prince Alfred's Volunteer Guard. The name was later changed to Prince Alfred's Guard. The Regiment first saw action on 2 December 1877, against the Gcaleka tribesmen in the Battle of Umzintzani during the Ninth Xhosa War. The next conflict that the PAG participated in was the Basutoland Campaign of 1880 to 1881, during which a 500 metre bayonet charge by the Regiment which led to the capture of the village of Lerotholi, an enemy village. The Regiment also took part in the Bechuanaland Campaign of 1897. The Regiment also served in the Second Anglo-Boer War of 1899 to 1902 - as mounted infantry - and took part in campaigns in the Orange Free State and the South African Republic. Members of the PAG volunteered for service in World War I, but there was dissension in the ranks after a long deployment on sentry duty in Cape Town. As a result the contingent was disbanded and most of its members saw active service during the war in other South African units. In 1913 the regiment was redesignated the 3rd Infantry Regiment (Prince Alfred's Guard) of the Active Citizen Force of the Union Defence Force, but regained its former name in 1934. During World War II, the regiment first served as link battalion for the 2nd Brigade, South African Infantry in North Africa, sending drafts of men to the fighting units, among which many went to the Field Force Battalion. The PAG was subsequently converted to an armoured unit and saw further active service with the 11th South African Armoured Brigade, South African 6th Armoured Division in Italy as a tank unit. The PAG also took part in the many skirmishes making up the South African Border War during the post-war period. On our way home from church this morning we stopped along the way to watch the bikes taking part in the annual Toy Run go by. The Toy Run is a national initiative which takes place in all the cities and big towns around South Africa. 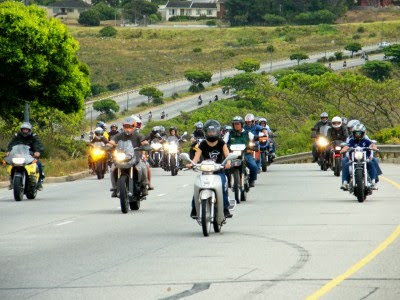 It is the largest motorcycle charity event in the world with about 50 000 motorcycles taking part nationally. The main purpose of the event is to collect and distribute toys and gifts to less privilaged kids. 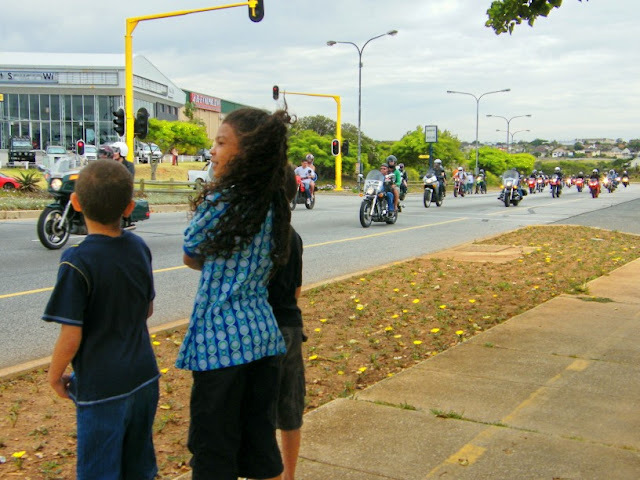 All the bikers come together in one place where the toys are collected and then go on a mass ride through the city. 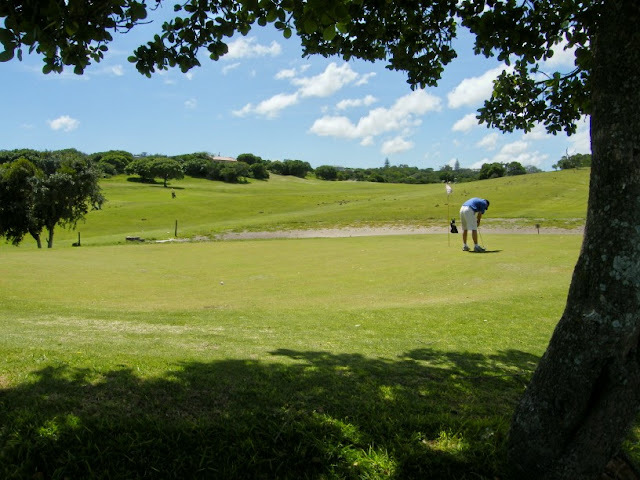 Port Elizabeth has a number of golf courses around the city. The best known one is the Humewood Golf Course, a links course which is seen as one of the best courses in the country. One of the lesser known ones are the 9 hole Sardinia Bay golf course. I'm not much of a golfer (not enough time), so I haven't played the big courses, but I thoroughly enjoyed playing Sardinia Bay the other morning with my Boet. 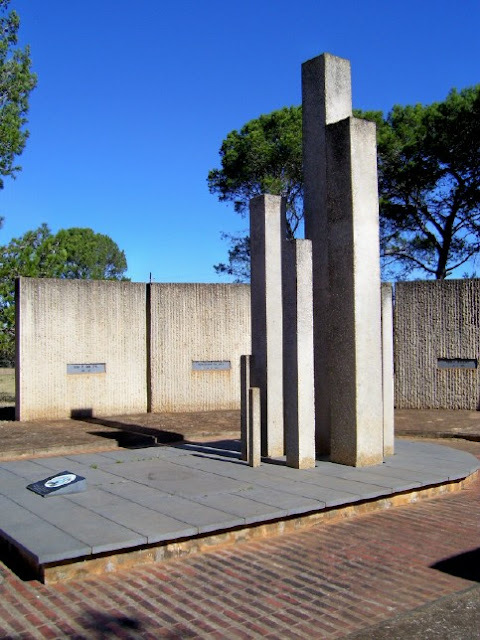 I have posted a picture of the Uitenhage Concentration Camp Memorial before, but wanted to post another. It is situated on the site where there was a concentration camp for Boer women and children during the Anglo Boer War (1899 - 1902). Each of the pieces of back wall represents one of the 9 people who died in the concentration camp. 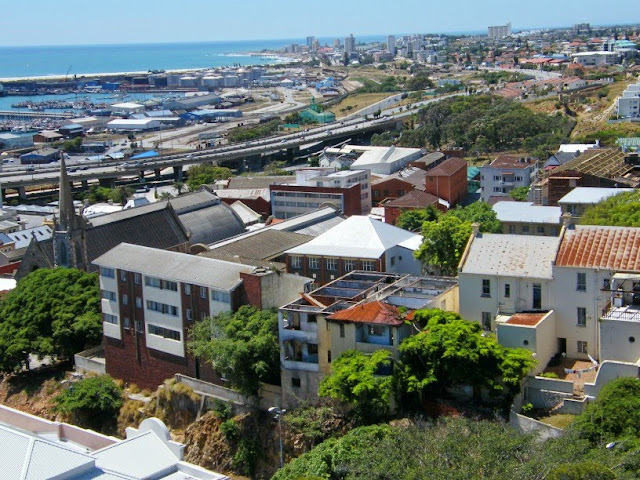 In the old days South End was a vibrant multi cultural area, but in the 1960's everybody was forcible removed from the area because of the Groups Areas Act and relocated to other areas in Port Elizabeth. The majority of the buildings in South End was demolished and the area laid empty for about twenty years. In the 1980's they started developing the area again and since Democracy in 1994 some of the people have even moved back into the area. 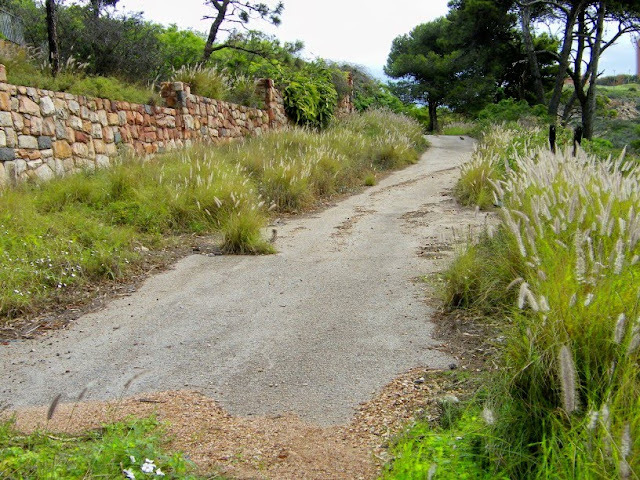 Here are one of the old South End roads that run past the South End cemetery. Today its nothing more than a footpath to the top of the hill. 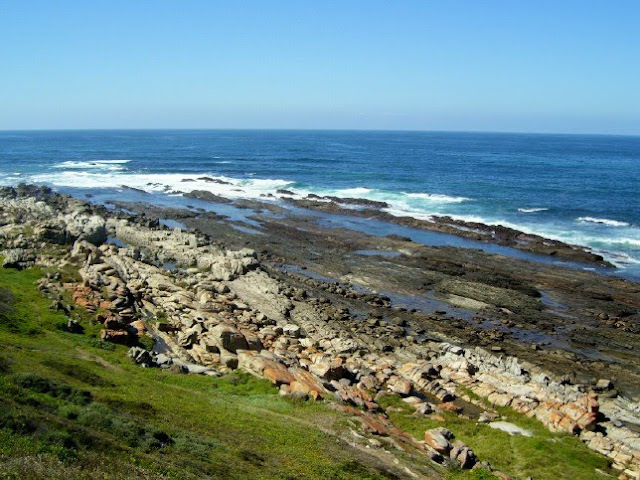 The southern coastline of Port Elizabeth from Cape Recife to Schoenmakerskop is generally knows as the Wildside. It's mainly because the coast is rugged with lots of rocks and little sand. Its also open to the prevailing south-westerly wind which means that it can become quite stormy out there outside the shelter of the Bay. After my last venture up the Donkin Lighthouse, Sue sent me two old pictures that were taken from the lighthouse in the late 1800's. She asked me if I had any pics taken in the same direction to be able to compare. I didn't, but took Chaos Boy to climb the lighthouse on Saturday and took a couple. I am sure that I recognise the rusty roof house in both the old and new pics. There is another one which I'm not 100% sure of, but keeping in mind that the lighthouse's height was increased since the early pics were taken, compare the pics for yourself. On Friday afternoon I made a quick stop for bread on my way home. As I came out the supermarket I saw the fire department's grass fire truck go by and noticed smoke just up the road. I rushed over and found a grass fire next to the suburb of Overbaakens. The fire truck pulled in just after me (yes, I took a shortcut) and the team got their kit out very quickly and got working on the fire. 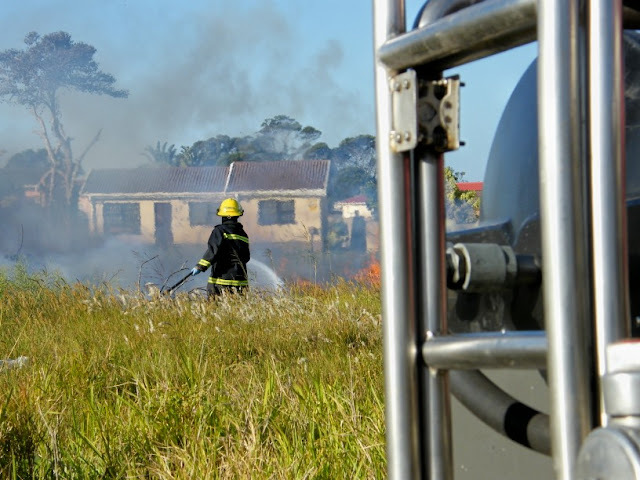 I was actually very impressed with the speed they got working on stopping the fire from getting to the houses. There are more picture on The Firefly Photo Files. 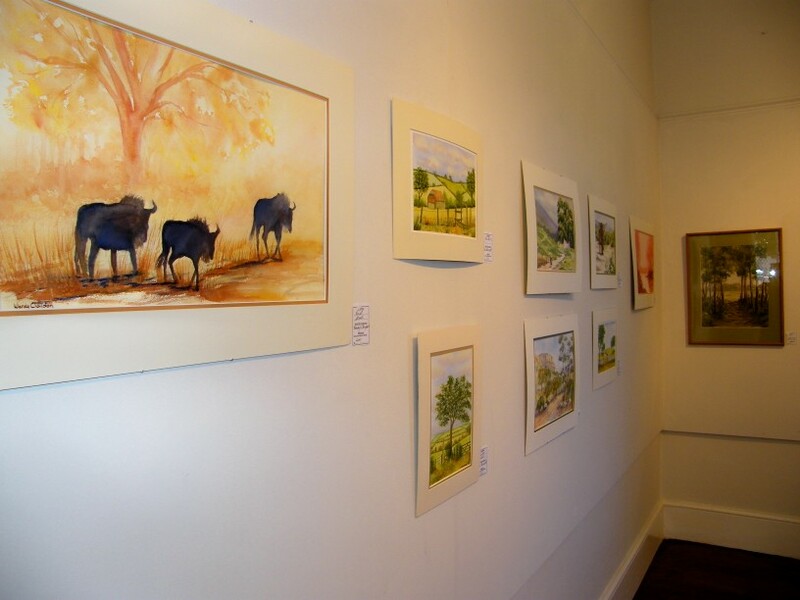 EPSAC is currently hosting an Watercolours exhibition by the East Cape Watercolour Association. I popped in on Friday to have a quick look and was quite impressed with some of the work on show. For anybody looking for the perfect Christmas gift for an art lover, this is the place to come and buy something. And best of all are the prices. The majority of the paintings range from about R150 (US$18.50 or 12.50 British pounds) to R450 (US$56 or 37.50 British Pounds). Yesterday (Friday, 20 November) was the deadline for submissions of personal tax forms. As per any deadline there were lots of people who hadn't done it timely either manually or via e-filing. 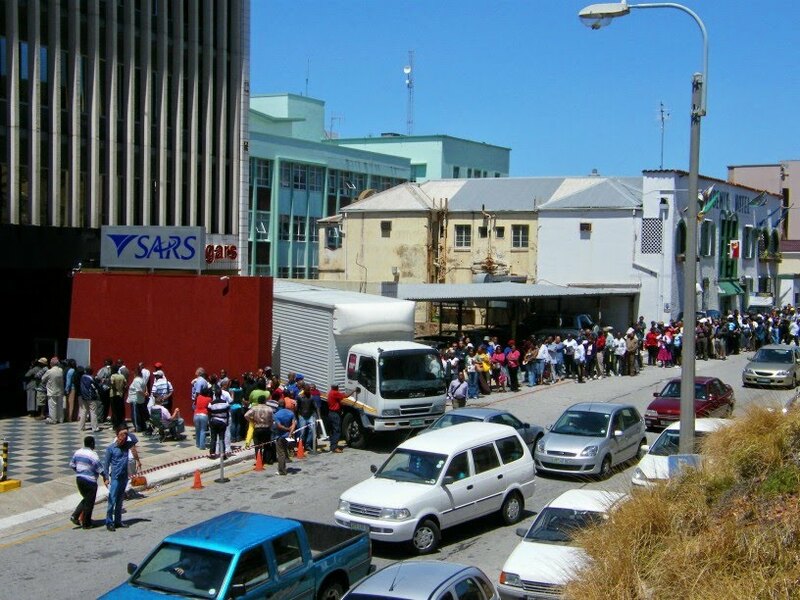 I drove past the SARS (South African Revenue Service) office in town at about 1pm and this was the line standing outside the door in the early summer heat. 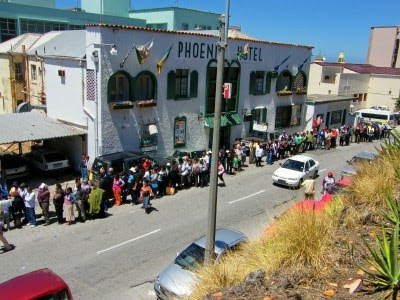 The second photo is just to show how the line continued past the Phoenix Hotel next door. A couple of the historic houses in one of the streets of Cental. In this immediate area there are many old settler houses that date back to the mid 1800's. Most of them are very well looked after and maintained while others are being restored. Unfortunately just down the street a couple of blocks away there are a lot of buildings crying out to be restored. 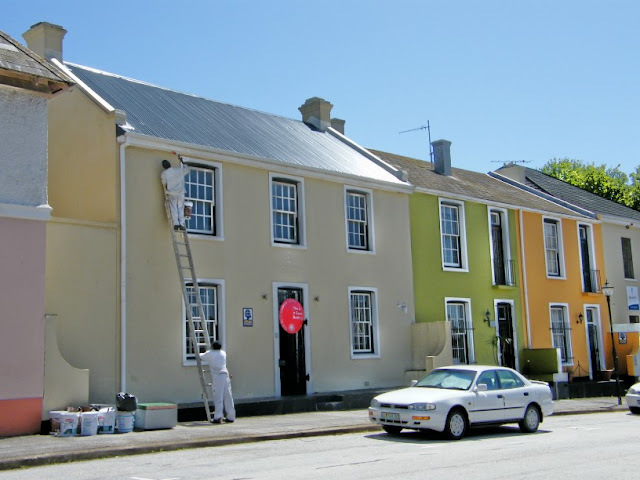 Unfortunately some of the property owners in Central doesn't care enough about the heritage buildings in their portfolios to fix them up to their former glory. The Maitlands River would never really be called a river of note, more like a local stream. 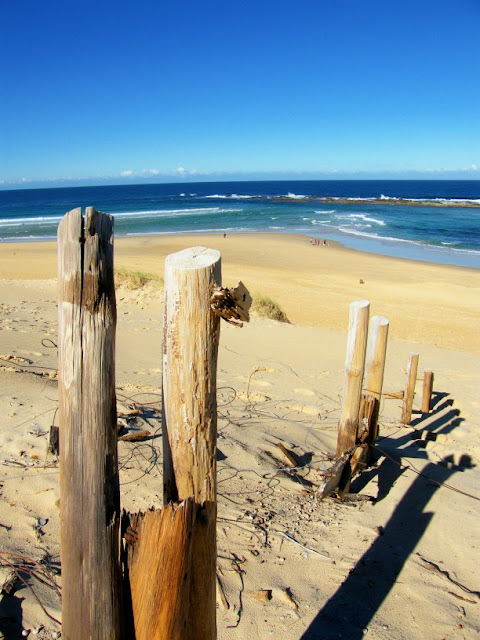 But on its way to the ocean it flows through Sleepy Hollow and past the giant Maitlands sand dune. 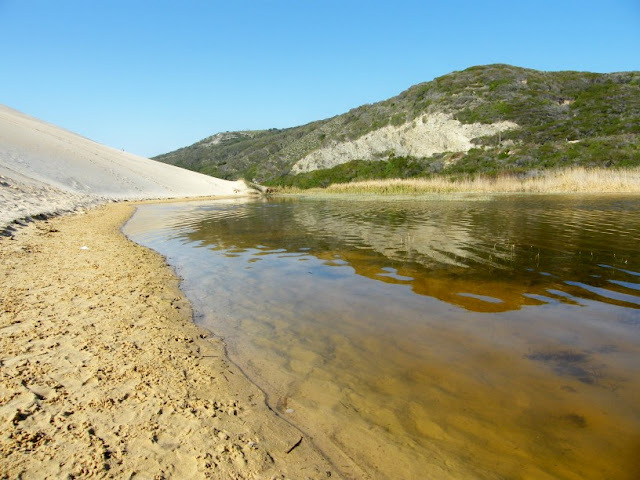 Just before it slowly flows into the ocean, it forms a small lagoon next to the dune. Usually in summer kids will splash around in it as the sea at the river mouth is a bit of a dangerous spot to swim in. 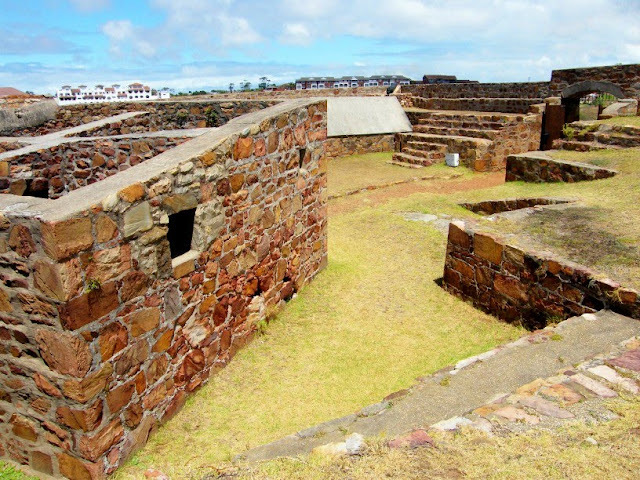 Fort Frederick can be found on the hill overlooking the Baakens River valley and Port Elizabeth Harbour. 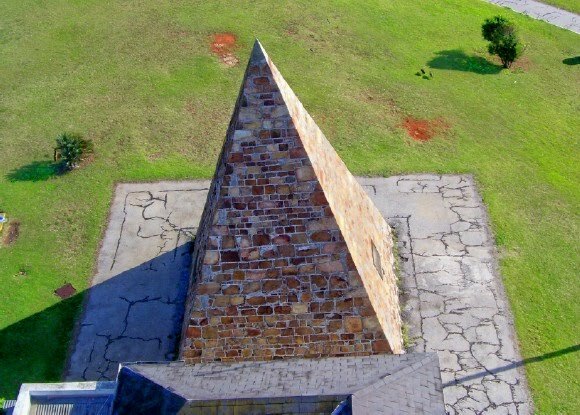 It's a stone fort built in 1799 by the British Forces to defend the mouth of the Baakens River to prevent a possible landing of French troops to assist the Graaff-Reinet rebels. It was named after Frederick, Duke of York and was commanded by Captain Francis Evatt. Even though the fort was built to defend the Bay, ironically, no shot was ever fired in anger from it. The Fort, containing a powder magazine and a guardhouse, was originally defended by eight 12-powder guns. 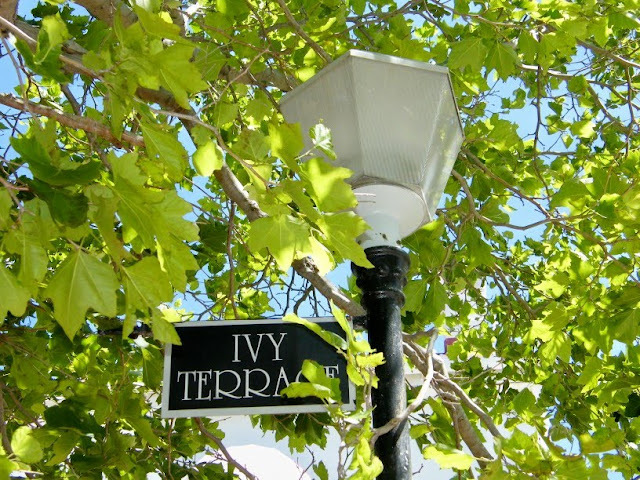 Havelock Square is one of a couple of public parks around the historic part of Central. Havelock square is a bit different though as it is an unfenced park with a one way paved road going around it. Havelock Square was part of The Grey Institute Grant originally surveyed in 1856, with the oldest houses being built in 1862. The Holy Trinity Church on the eastern side of the square was built in 1866 and re- built in 1897 after being destroyed by a fire, while the St Johns Methodist Church on the western side was opened in 1894. 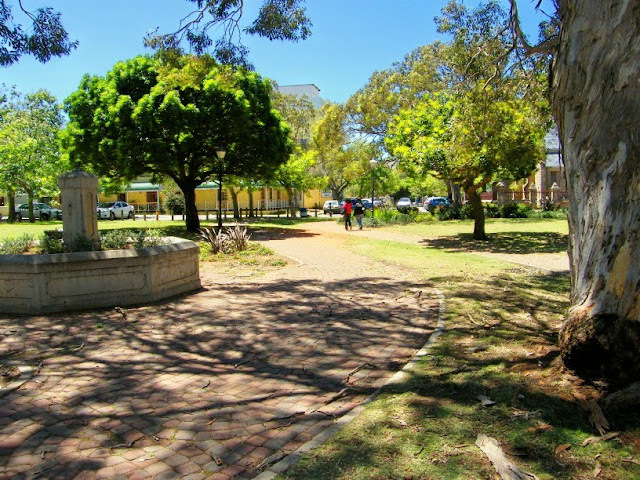 Havelock Square is situated on the Donkin Heritage Trail and is a stone's throw away from some of Central's best know historic sites as well as the restaurants in Parliament Street. 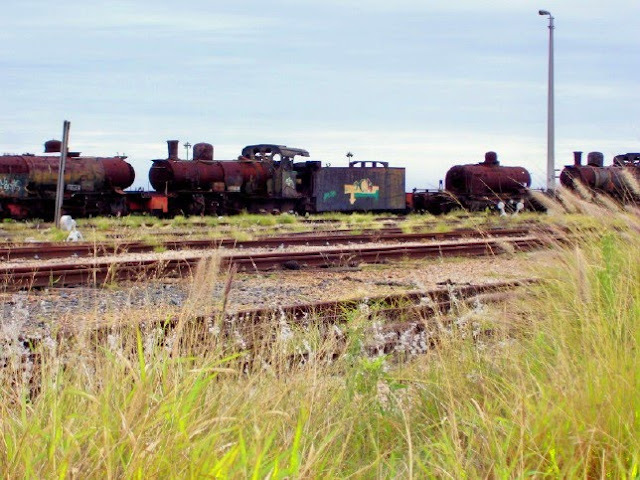 The Humewood Station is Port Elizabeth's main narrow gauge station and is mainly used by the Apple Express tourist train. Big parts of the old station is in desperate need of repair while a section of it acts as a grave yard for old steam trains and rolling stock. Steam train enthusiasts would probably look at the remains of some of those trains and pick away a tear in sadness. Unfortunately the reality is that Spoornet doesn't have much use for the narrow gauge line from Humewood and should actually privatise it so that it could be maintained and better utilised. Going for a walk along the beach at Cape Recife the other day, we found this big patch of seaweed washed up on the beach. 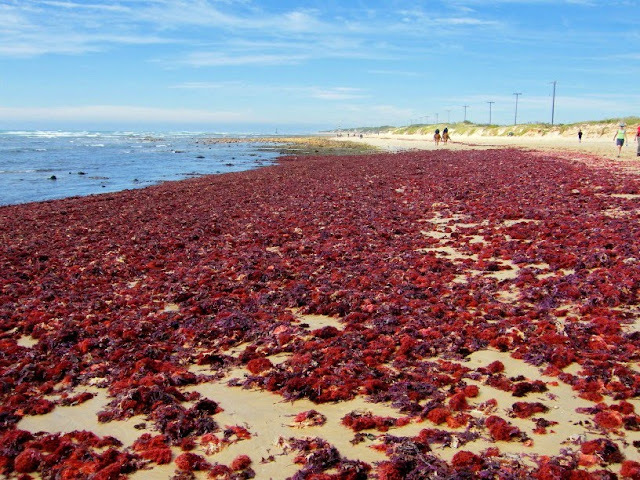 A lot of seaweed like this gets loosened from the sea floor during storms and after a strong easterly wind gets washed up on the beach. 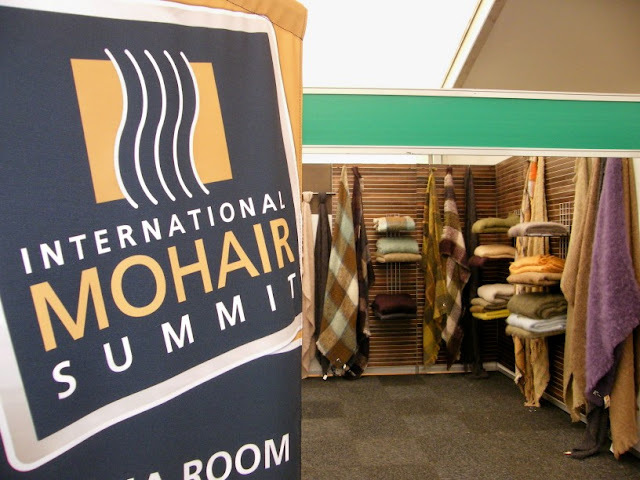 The first biennual International Mohair Summit took place in the Karoo town of Graaff Reinet last week. "What does it have to do with Port Elizabeth?" I hear you ask. 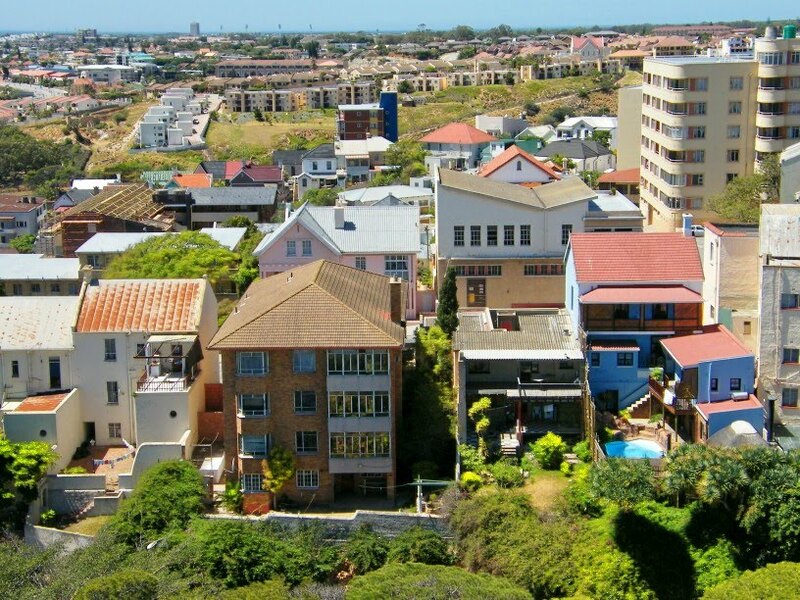 Well, Port Elizabeth is seen as the mohair capital of the world as more mohair moves through this city than anywhere else in the world. If you want to learn more about the summit, you can read more about it on The Firefly Photo Files. 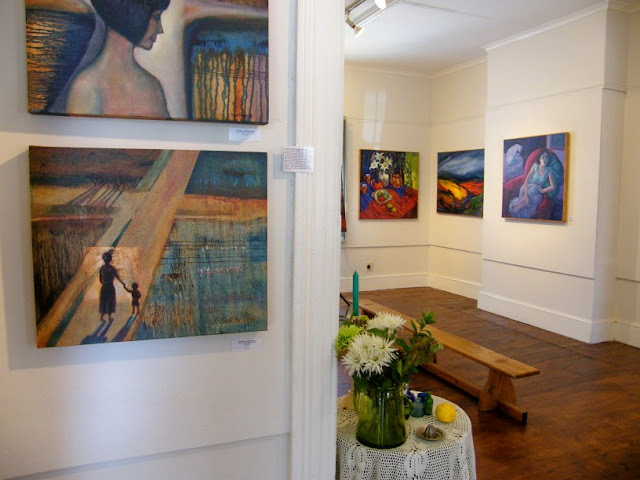 I popped into the EPSAC gallery a day or so ago to have a look at the 4 WOMEN exhibition that is currently on. Esme Goosen, Rina Badenhorst, Roma Cloete and Sue Hoppe (who some of you will remember as one part of SAM, my predecessor on PEDP), who each have strong and distinctive styles, are presenting a group exhibition of their recent work. A feature of this exhibition is that some of the artists will set up a still life in the gallery, and will spend some time painting there during the exhibition, so that interested art lovers can see their different approaches and see works in progress. A silent auction are being held on these "works in progress" and the winning bids will be announced when the exhibition closes at noon on Saturday 14th November. A portion of the proceeds will be donated to the EPSAC Red Brush fund to help towards renovating costs. The next exhibit presented at EPSAC will be a watercolours exhibit of which I hope to show you something in due coarse. 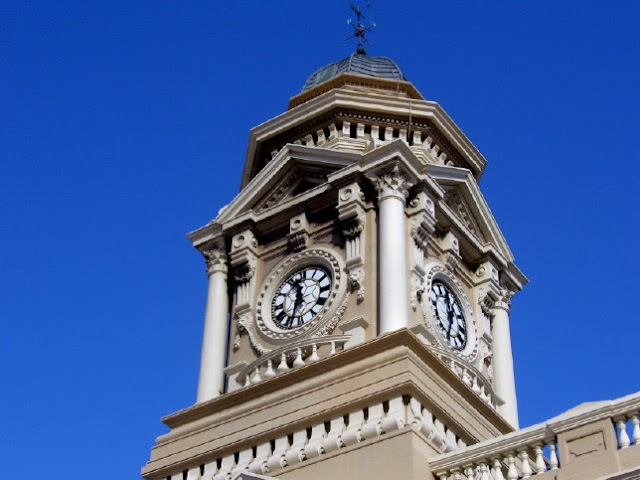 The area of Central is one of the oldest areas in Port Elizabeth with the most historic building. Even though there are property owners who are in the news a lot for not fixing up their properties, there are a lot of people who does take care to restore their building to its former glory. I took a walk around Central the other day and it is amazing to see how many people are fixing and painting their building. It seems that slowly but surely Central is being fixed up. 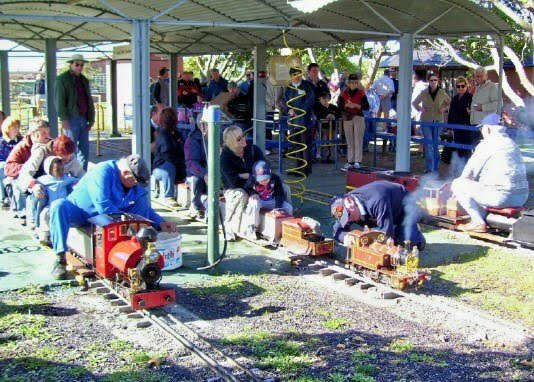 The Port Elizabeth Model Locomotive Society runs their minituare trains at Londt Park every first Sunday of the month. It is a very popular morning outing for anybody with little kids, but enjoyed just as much by the big kids (if you know what I'm saying). Yesterday I posted a pic of one of the food stalls at this weekend's Wholesome Market. 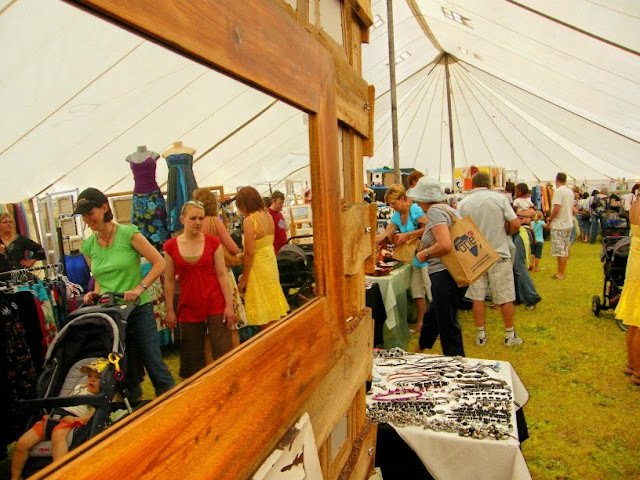 Today I want to add a pic taken inside the craft tent at the market. The crafts where mostly handmade stuff ranging from jewelry and clothes to toys and Christmas decorations. 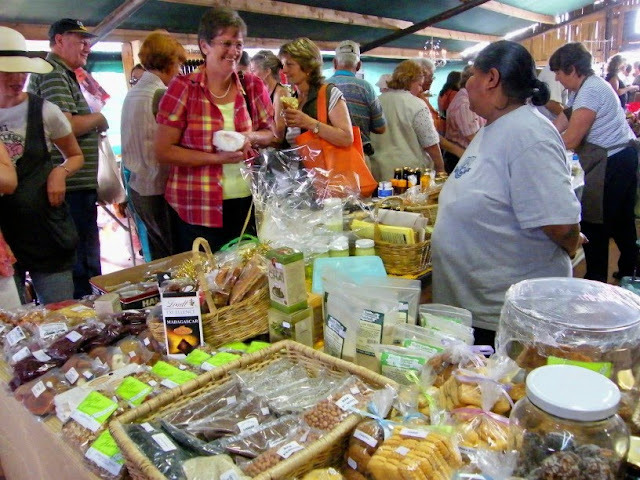 This weekend the Wholesome Market took place for the first time at Holmeleigh Farm out on Kragga Kamma Road. The Wholesome Market takes place every first weekend of the month and after getting too big for their previous venue at Sherwood Garden Centre, the organisers decided to move to the open piece of land next to Holmeleigh Farmyard. For me the Wholesome Market has become the new Art in the Park, but without all the junk stalls. The organisers have put together an awesome variety of stalls ranging from arts and crafts and home made furniture to fresh produce, milk, bread, and baked goods. For more information, go to Wholesome Market. The organisers can be contacted at wholesomemarket@gmail.com, Phone: +27 (0)41 3662257 or Mobile: +27 (0)84 4309684. This is the view of the Donkin Memorial (Donkin Pyramid) from the top of the lighthouse on the Donkin Reserve. 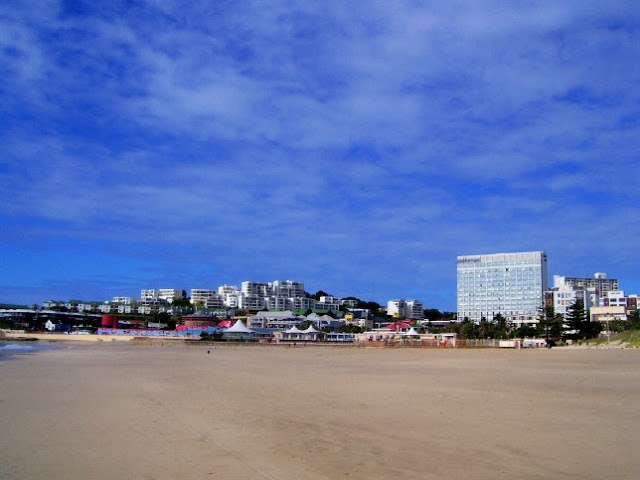 Kings Beach is one of Port Elizabeth's premier beaches. It stretches from McArthur Baths to the harbour wall over a distance of nearly 2 kilometres. This picture was taken a little while ago in the winter looking towards McArthur Baths and Bayworld Museum complex. How do you know it was taken in winter. Because in summer the beach will be packed with people. A couple of years ago the municipality built a walkway from one of the parking lots at Sardinia Bay across a big dune to give easier access to the beach. The problem is that the dune is slowly moving and didn't like this walkway built across its back. This is what's left of it. Yesterday I featured the Cuyler Manor Museum. When I visited the museum, one of the ladies who work there showed me around the grounds and buildings. 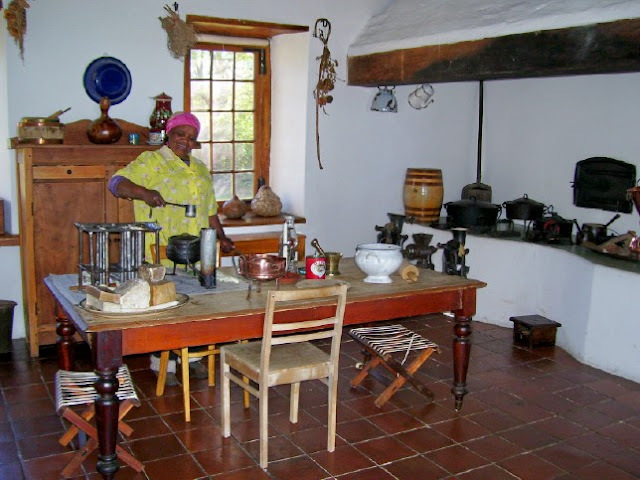 In the restored kitchen she show me all the old kitchen equipment and demonstrated how they made candles in the old days. 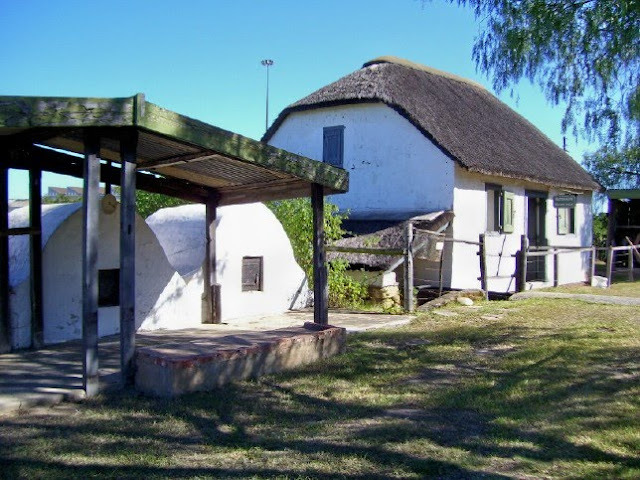 The Cuyler Manor Museum in Uitenhage was built as a homestead for General Jacob Glen Cuyler, who was the Landdrost of Uitenhage from 1806 to 1827. 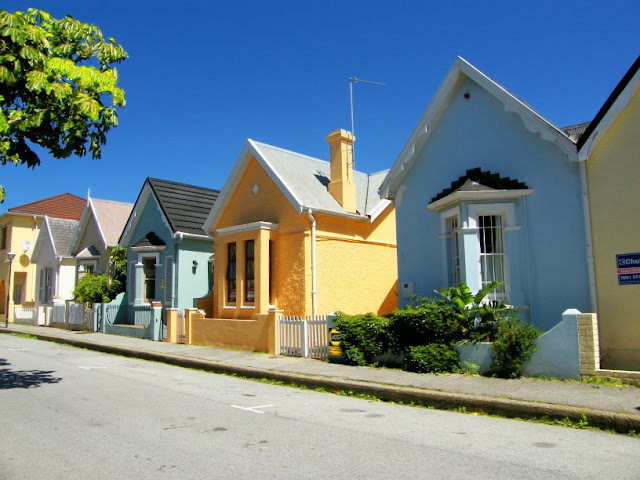 Recent years have seen the Cape Dutch Style house been lovingly restored to its former glory, and furnished in the style of its period. The museum feature a variety of farm buildings, equipment and old wagons. In the picture is the old mill building which still has a working water driven mill. I have featured Fort Frederick before (also here). I just though I'll show a slightly different angle. 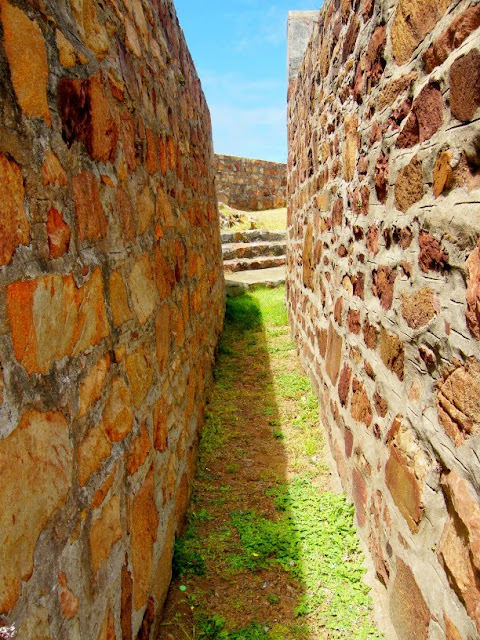 This of an alley between the old block house and the outer wall of the fort.